The debate around iconic bathing boxes in 2017, resulted in City Coastal Management calling for public participation in the concerns around the maintenance, security and utilisation thereof. The detailed report presented at sub-council on 20 November 2017 can be viewed here. In a nutshell, the once-off restoration costs of the 38 bathing boxes on Muizenberg Main beach is estimated at R869 698.17! There are major challenges with retaining all bathing boxes. Because of the extreme exposure due to dynamic coastal processes they need to be secured and maintained at high cost. This means an upgrade process together with sourcing funds for future maintenance is essential for successful outcomes. Therefore, costs for council funding need to weighed against other city demands. Based on these very relevant issues the following recommendations have been made to retain the eight at Surfers Corner and a portion of those on Muizenberg Beach with components from the rest to be used for maintenance of those remaining. The restoration and retention of the 8 bathing boxes at Surfers’ Corner. 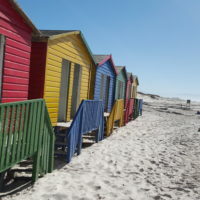 The removal of the 17 dilapidated bathing boxes nearest to Zandvlei River mouth (some of the materials will be stored to assist with future maintenance and repairs of the other huts). The 38 huts on Muizenberg Main Beach. The report indicates: 17 to go and 21 to remain. This subject remains a sensitive issue and we await further feedback regarding the in-depth report from Coastal Management with regard to point 3. Also read Muizenberg Looking Back, a glimpse at where and how these iconic huts fits in with Muizenberg. ← Water Crisis: Save or Queue?